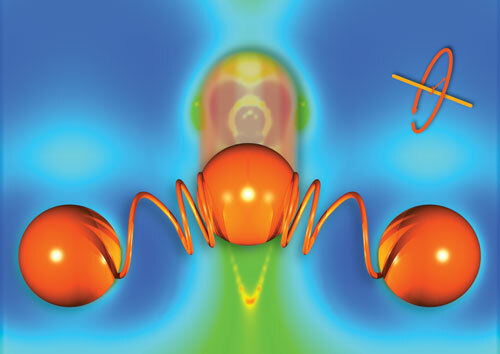 (Nanowerk News) Researchers at The Ohio State University have discovered how to control heat with a magnetic field. In the March 23 issue of the journal Nature Materials ("Phonon-induced diamagnetic force and its effect on the lattice thermal conductivity"), they describe how a magnetic field roughly the size of a medical MRI reduced the amount of heat flowing through a semiconductor by 12 percent. The study is the first ever to prove that acoustic phonons--the elemental particles that transmit both heat and sound--have magnetic properties. "This adds a new dimension to our understanding of acoustic waves," said Joseph Heremans, Ohio Eminent Scholar in Nanotechnology and professor of mechanical engineering at Ohio State. "We've shown that we can steer heat magnetically. With a strong enough magnetic field, we should be able to steer sound waves, too." People might be surprised enough to learn that heat and sound have anything to do with each other, much less that either can be controlled by magnets, Heremans acknowledged. But both are expressions of the same form of energy, quantum mechanically speaking. So any force that controls one should control the other. "Essentially, heat is the vibration of atoms," he explained. "Heat is conducted through materials by vibrations. The hotter a material is, the faster the atoms vibrate. "Sound is the vibration of atoms, too," he continued. "It's through vibrations that I talk to you, because my vocal chords compress the air and create vibrations that travel to you, and you pick them up in your ears as sound." The name "phonon" sounds a lot like "photon." That's because researchers consider them to be cousins: Photons are particles of light, and phonons are particles of heat and sound. But researchers have studied photons intensely for a hundred years--ever since Einstein discovered the photoelectric effect. Phonons haven't received as much attention, and so not as much is known about them beyond their properties of heat and sound. This study shows that phonons have magnetic properties, too. "We believe that these general properties are present in any solid," said Hyungyu Jin, Ohio State postdoctoral researcher and lead author of the study. The implication: In materials such as glass, stone, plastic--materials that are not conventionally magnetic--heat can be controlled magnetically, if you have a powerful enough magnet. The effect would go unnoticed in metals, which transmit so much heat via electrons that any heat carried by phonons is negligible by comparison. There won't be any practical applications of this discovery any time soon: 7-tesla magnets like the one used in the study don't exist outside of hospitals and laboratories, and the semiconductor had to be chilled to -450 degrees Fahrenheit (-268 degrees Celsius)--very close to absolute zero--to make the atoms in the material slow down enough for the phonons' movements to be detectible. That's why the experiment was so difficult, Jin said. Taking a thermal measurement at such a low temperature was tricky. His solution was to take a piece of the semiconductor indium antimonide and shape it into a lopsided tuning fork. One arm of the fork was 4 mm wide and the other 1 mm wide. He planted heaters at the base of the arms. The design worked because of a quirk in the behavior of the semiconductor at low temperatures. Normally, a material's ability to transfer heat would depend solely on the kind of atoms of which it is made. But at very low temperatures, such as the ones used in this experiment, another factor comes into play: the size of the sample being tested. Under those conditions, a larger sample can transfer heat faster than a smaller sample of the same material. That means that the larger arm of the tuning fork could transfer more heat than the smaller arm. "Imagine that the tuning fork is a track, and the phonons flowing up from the base are runners on the track. The runners who take the narrow side of the fork barely have enough room to squeeze through, and they keep bumping into the walls of the track, which slows them down. The runners who take the wider track can run faster, because they have lots of room. "All of them end up passing through the material--the question is how fast," he continued. "The more collisions they undergo, the slower they go." In the experiment, Jin measured the temperature change in both arms of the tuning fork and subtracted one from the other, both with and without a 7-tesla magnetic field turned on. In the absence of the magnetic field, the larger arm on the tuning fork transferred more heat than the smaller arm, just as the researchers expected. But in the presence of the magnetic field, heat flow through the larger arm slowed down by 12 percent. So what changed? Heremans said that the magnetic field caused some of the phonons passing through the material to vibrate out of sync so that they bumped into one another, an effect identified and quantified through computer simulations performed by Nikolas Antolin, Oscar Restrepo and Wolfgang Windl, all of Ohio State's Department of Materials Science and Engineering. In the larger arm, the freedom of movement worked against the phonons--they experienced more collisions. More phonons were knocked off course, and fewer--12 percent fewer--passed through the material unscathed. The phonons reacted to the magnetic field, so the particles must be sensitive to magnetism, the researchers concluded. Next, they plan to test whether they can deflect sound waves sideways with magnetic fields.